The Gift Shop and Boutique at The Tea Leaf offers something new each time you visit. We strive to find and offer unique and one-of-a-kind items at affordable prices. You will find Pilgrim Candle Company Candles in a wide variety of fragrances in both traditional and primitive glass jars. 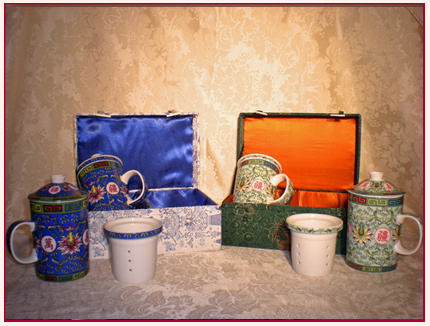 Candles in tea cups and tea cup gift bundles are ready-to-give gift items. Bath and beauty products to luxuriate, relax, refresh and recharge with Eye Tea Bags, Foot Soak Tea Bags, Victorian soaps and bath teas, Harney and Sons Bath Teas and Caren body, hand and foot care products, gift bundles, and travel-sized sets make wonderful gifts to someone special. From Vintage-look jewelry and purses, gloves and shawls to classic and up-to-date handbags, hats, blouses, outerwear, and art print umbrellas, the Tea Leaf Boutique has it all. Whether you are a tea fanatic, or just appreciate a good read, browse our book and magazine section where you’ll find Bliss Victoria, The Tea House Times, Tea - A Magazine, Tea Time, Paula Deen, and more. Enjoy a good mystery? Then you’ll surely want to take home a tea or scrapbook mystery by Laura Childs. If cooking is your thing, we carry several cookbooks and tea recipe books. We also offer books on scrapbooking, blank journals, stationery, and much more. Our quality Victorian art prints and original art by local artists adorn our walls and are offered for purchase. Our antique reproduction furniture such as the red English Telephone Booth which serves as a curio cabinet or the smaller version which store all your CD's and DVD's are just two of several we offer for purchase by special order. The Tea Leaf now offers the popular Wilcor walking/hiking poles. Proven to burn more calories while you walk or hike, Wilcor walking/hiking poles will also steady your walk while improving posture and balance.